So, how much does it cost to have a baby? 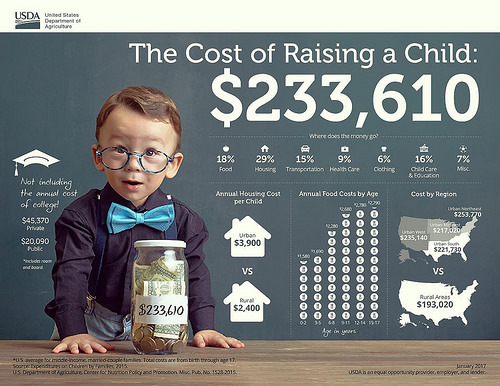 According to a recent report by the USDA, The Cost of Raising a Child, families with a child born in 2015 are projected to spend an average of $233,610 raising their kid. Where does the money go? According to the report, "For a middle-income family, housing accounts for the largest share at 29 percent of total child-rearing costs. Food is second at 18 percent and child care/education (for those with the expense) is third at 16 percent." These statistics may seem overwhelming but no need to get too stressed! Plenty of parents have stood where you are wondering if they have the finances to support a tiny human being. With a little planning, mindful shopping, and a few tricks of the trade, having a baby on a budget is totally doable! First things first. Create a budget. Not in your head, not on a whim but physically written down and typed out. Decide how much money you can spend and stick to the plan. The internet is full of helpful budget sheets and templates. Check out an excel sheet and other helpful tips via blog Tune My Heart here. Separate Needs From Wants Pick out your baby registry items carefully, making sure to select only things you absolutely need. Include more pricey items as your friends and family may want to all chip in and get you one long term investment item like a bed or stroller. Look For Gently Used Items Talk to your friends and family who have had children and see if they have any clothes they can pass down to you. Send out a few emails and put up posts on social media. Then, hit up consignment sales, garage sales, and the internet. Amazon and Target are also great places to shop and catch awesome deals. Blogger Swaddles N Bottles says it best: "Your baby doesn’t need an excess of anything except for diapers." Take into account the lifespan of baby clothes during the first two years and buy clothes in small batches. This requires not losing your mind at Target buying 20 pairs of tiny sneakers and a dozen onesies with animal faces. Just a few will do. Changing Table - consider one that attaches to a table or dresser instead like this one. Baby Bath Tub - Your baby will soon be big enough for the regular tub. Try a Baby Ring Sling instead. Fancy Diaper Bag- How about using an old purse? Baby Laundry Basket Just put your baby's clothes in your own basket. For even more ideas check out Throwing a Gender Reveal Party on a Budget and Throwing a Baby Shower on a Budget. 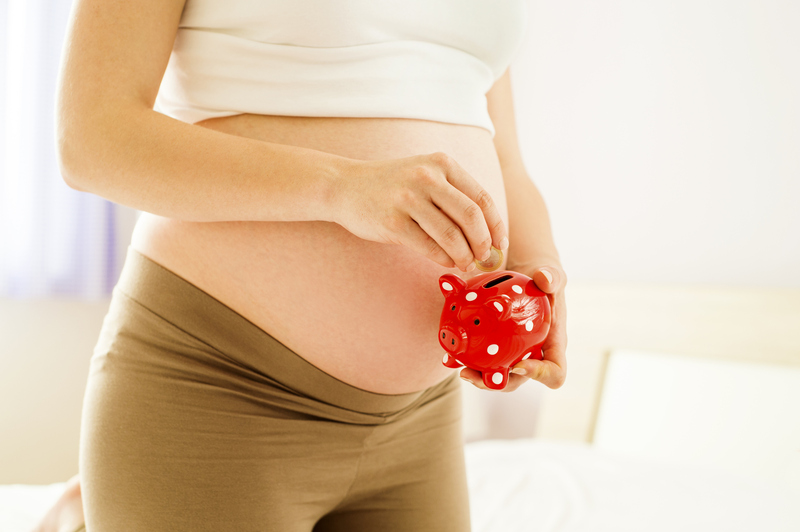 You can also head to our Baby Budget Pinterest board!